At a time when the business pages are filled with stories about doom and gloom on the financial markets and the plight of banks dealing with the “credit crunch”, we go shopping. Eric Ravilious’s gorgeous and iconic High Street is now too expensive for most of us to buy – at least while the banks clamp down on lending – but it takes us back to a time when shops could be small, individual and full of exotic and wonderful wares. 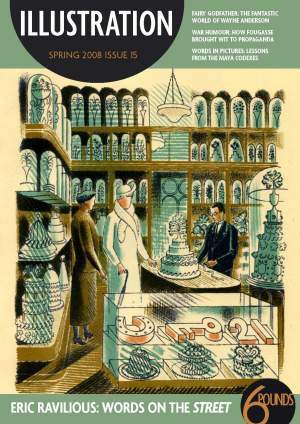 Ravilious’s gorgeous autolithographs bring out both the reality and the fantasy of these miniature retail emporiums and remind us that window shopping is a pleasure that can never be replaced by a click with a mouse. Production and display are also the themes of many of the pictographs in the codexes produced by the Maya in Central America. Their scribes recorded essentials from astronomy and religion to bee-keeping, weaving and agricultural practices – real and spiritual life inseparably entwined. Fantasy and reality collide in a very different way in Winsor McKay’s Dream of the Rarebit Fiend cartoon strip. While the subject is obviously fantastic, much of the material was based on contemporary US life and often draws on McCay’s own personal experiences. A few decades later, on the other side of the Atlantic, Fougasse (Cyril Kenneth Bird) took the grim reality of war, fifth columnists and fear of the blitz and used gentle humour and a sense of the absurd to persuade people to behave well in a world gone mad. His simple designs have become classics, but this simplicity has perhaps allowed posterity to underestimate their sophistication. We redress this balance and look at the thought behind the well-known images. The illustrations of Wayne Anderson are clearly fantasy, but are made possible by a real work ethic and “obsessive” attitude. Fantasy makes reality palatable: we offer this issue as an antidote to economic woes.